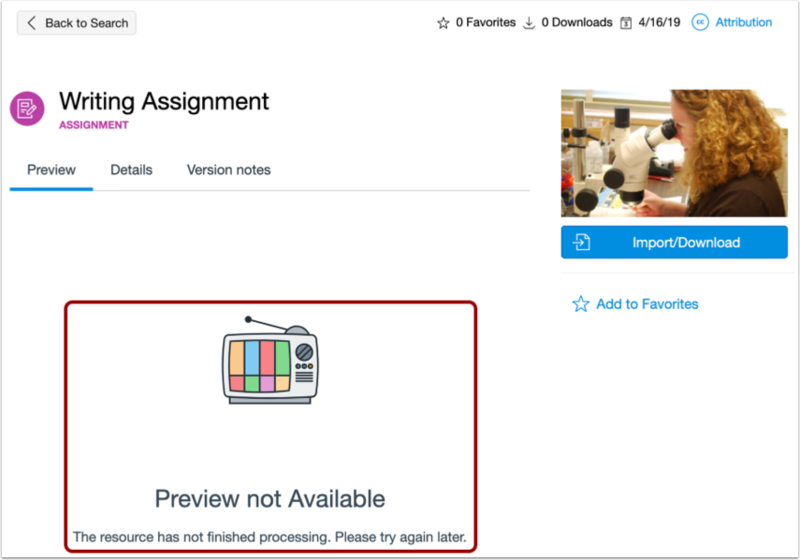 If you modify a resource (learning activity) in Canvas that was previously shared to Commons, you can share the modified resource to Commons again to update the existing resource in Commons. Only the user who originally shared a resource to Commons can update resource content. However, administrators can edit resource details. If you choose to update a previously shared resource, the previous version will be replaced. If you choose not to update a previously shared resource, a new resource will be created. 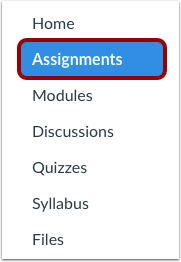 In Course Navigation, click the feature area link where the resource exists that you want to update. 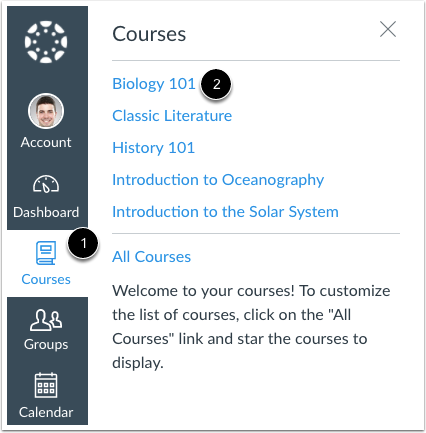 If you modified a course and want to share it to Commons as an update, navigate to course Settings. Note: When updating a file, if you change the file name, Commons might not be able to match it with your existing resource. Locate the resource  and click the Options icon . Then, click the Share to Commons link . 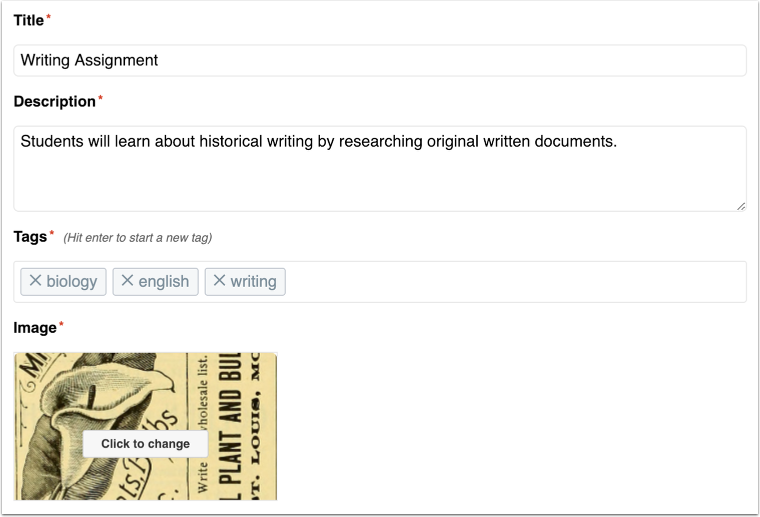 Commons will automatically check whether or not the resource can be updated and create a default option. To manually choose whether or not the currently shared resource is an update to a previously shared resource, click the update toggle. If you choose not to update the previously shared resource, a new resource will be created. Resources not previously shared to Commons will not have an update option. Commons will verify the best match for which resource you are updating. To change which resource you are updating, click the Change button. A list of previously shared resources is pre-populated for you. To update a resource, click the radio button next to the desired resource. In the Version notes field, let users know what you updated. Version notes will be visible to users on the resource details page. If necessary, edit resource information, content licensing, and sharing options. Note: Resources that are no longer in a user's scope will not appear on the user's Updates page. For example, changing the share option from your account to within specific groups. When you are ready, click the Update button. View your updated resource. It may take up to 30 minutes to process a resource. Resource previews are not available while the resource is processing. Previous Topic:How do I share a document, image, video, or audio file to Commons? Next Topic:How do I edit the details of a resource in Commons? Table of Contents > All Users > How do I update a resource I previously shared to Commons? Re: How do I delete a quiz I posted in Commons?